Linux driver code contains some serious garbage. I heard this refrain, but I did not realize how bad it was until I looked at it myself. Here is just one example. Device drivers typically read static memory, typically known as EEPROM or ROM, from the chip to identify version, hard-coded information, device capabilities, etc. These values are used throughout execution of the driver. The reading process is among the first things when the device is attached and powered on. Now, rom->channel_plan is set to the correct value. Simple. In this example, params comes from a list of ROM offsets values set in the previous calling function. (That alone made tracing difficult.) The rtlefuse->eeprom_version is now the same as FreeBSD’s rom->version. This manual process repeats for every variable in the ROM. While that may be just annoying and require a negligible bit more CPU power, this is not be a problem if it was done all in one place. But instead, the driver reads from the hwinfo blob on a seemingly as-needed during execution. And because these as-needed instances are during normal execution, the driver reads-in the same static value from hwinfo every a simple WiFi function occurs, such as changing the channel. Okay, but even that might not be too difficult…right? Here’s the real kicker. Notice the line hwinfo[eeaddr++]! Merely reading in that variable changes the offset. Its the Heisenberg Uncertainty Principle equivalent of code. This is a cleaned-up version of the 188-line function. The actual function has 6 nested for-loops, some with if-statements, each incrementing the eeaddr parameter as they go along. Why would anyone do it this way? You are needlessly using up the CPU, making the code difficult to follow, repeatedly reading in static values and making any minor modifications and re-ordering or re-structuring will essentially break the entire function. And perhaps the worst offender is when 20 functions deep you are not even working with hwinfo anymore. You are working to a pointer to hwinfo that has been incremented God-knows where, with their own offsets that are near impossible to track down. In my efforts to port this driver to FreeBSD, I literally resorted to printing out the entire ROM, manually finding the memory, and backing into the equivalent offset. Other bizarre code: I have seen if-conditions that are impossible to reach, misplaced code that should go in the previous function, code that does bits of a tasks, while another function does the entire task – so repeat code, unnecessarily repeated code, etc. How does this make it into the Linux Kernel? To be fair, this does not appear to be the fault of Larry Finger, who maintains this driver. This is the fault of Realtek, for vomiting this terrible driver in the first place, providing absolutely zero documentation and refusing to respond to any contact attempts. I hope my FreeBSD port is cleaner and more performant! The following is a quick and dirty guide on how to setup remote dual booting for FreeBSD (12.0-CURRENT) and Linux (Ubuntu 16.04). Granted, this method is slightly a hack, but it works and suits my needs. Why remote dual-booting? I am currently developing a FreeBSD kernel module for a PCIe card. The device is supported on Linux and I am using the Linux implementation as documentation. As such, I find myself frequently rebooting into Linux to look printk() outputs, or booting into FreeBSD to test kernel code. This device is located at my house, and I typically work on it during my downtime at work. Why not use Grub? I would have preferred Grub! But for whatever reason, Grub failed to install on FreeBSD. I do not know why, but even a very minimalistic attempt gave a non-descriptive error message. efibootmgr? Any change I made with efibootmgr failed to survive a reboot. This is apparently a known problem. Also, this tool only exists on Linux, as FreeBSD does not seem to have an efibootmgr equivalent. Ugh, so what do I do??? The solution I came up with was to manually swap EFI files on the EFI partition no an as-needed basis. First, I went into the BIOS and disabled legacy BIOS booting, enabled EFI booting, and disabled secure booting. Then, I installed Ubuntu. I had to manually create the partition tables, since by default the installer would consume the entire disk. However, this does not automatically create the EFI partition. So, you must manually create one. I set mine to 200MBs as the first partition. After installation, I booted up, mounted the /dev/sda1. I found that ubuntu had created /EFI/ubuntu/grubx64.efi and other related files. Great! Next, I installed FreeBSD and while manually setting up the partition tables, FreeBSD auto-created an EFI partition. One already exists, so I safely deleted it, and proceeded with the rest of the install. Right before rebooting, I mounted /dev/ada0p1 (sda1 on Linux) as /boot.local/ and /dev/da0p1 as /boot.installer/. I then copied /boot.installer/EFI/BOOT/BOOTX64.EFI too /boot.local/EFI/BOOT/EFIBOOT/BOOTX64.EFI (I think I had to re-create EFI/BOOT, I’m forgetting off-hand). Then I rebooted. When I rebooted the machine, Ubuntu still came up. This is because Ubuntu edits the EFI boot order and places ubuntu as the first partition. Ordinarily you should be able to use efibootmgr here to boot into FreeBSD and use the non-existent FreeBSD equivalent to boot back, but with the lack of that option, I mounted the EFI partition (/dev/sda1) as /boot/efi, and when I wanted boot into FreeBSD, I renamed /boot/efi/EFI/ubuntu/grubx64.efi to ubuntu.efi and then copied /boot/efi/EFI/BOOT/BOOTX64.EFI to /boot/efi/EFI/ubuntu/grubx64.efi. When I rebooted, FreeBSD came back up! Then on the FreeBSD side, I mounted /dev/sda1 to /boot/efi and did copied /boot/efi/EFI/ubuntu/ubuntu.efi to /boot/efi/EFI/ubuntu/grubx64.efi. And that’s it! I can now remotely boot back and forth between the two systems. Ugly? Yes. But it does the job. Linux could fix this problem by debugging their efibootmgr utility and FreeBSD could fix this by having an efibootmgr equivalent at all. They’re the same damn thing. No really, they are identical. The only differences are what software comes pre-installed and some user interface prettiness. Otherwise, no difference in the underlying system at all. Literally no difference. Warning, this is an unstructured Rant. I’m going to be setting up FreeNAS to manage my home’s personal NAS server. I spent a bit of time looking up the hardware and learning how FreeNAS works. I also really like that its a FreeBSD system at the back-end, so that I can always configure it exactly how I want. This resparked an interest in me to look into the BSD variants to see if they would be better for me. TL;DR – No, I’m sticking with Linux. People talk about BSD being “more mature”. But I have yet to get a solid understanding of what this means to the end-user, where Linux seems pretty damn mature to me. I haven’t had Linux crash on me since some bug in kernel 2.6. Or is the code more reviewed? The Linux kernel is heavily, heavily reviewed. Or is BSD an OS whereas Linux is a Kernel? Okay, I use Debian distributions, not just a raw Linux kernel. And besides, there are basically 4 main distributions that are largely differ on trivial matters behind the scenes. But you have like 5 main variants of BSD – OpenBSD, FreeBSD, NetBSD, DragonflyBSD and now MacOS X. These OS’s have, in some cases 20 years of variations between them, whereas at least all Linux’s share a common kernel. And another thing – why do people treat BSD as some common platform, as if they’re all the same? Do the 20+ years of divergence mean nothing? NetBSD likes to brag about being able to run on a toaster. Great. But in the year 2015, I don’t need to run on a computer from 1986. I don’t plan on running a Unix/Linux system on a Playstation. Okay, so OpenBSD has security built-in. Are you talking the security in packages or the security of the OS? If you mean the security of the packages, this can be trivially done on Linux. If you mean the security of the OS, you’re talking about memory protection and related features that can, and are, very easily ported over to Linux. Or is it that BSD systems are for servers? I currently work for a company that measures its internet presence of IP space in the percentages, and we use Redhat or CentOS – and legacy AIX and other random systems. okay okay, maybe BSD is great for niche devices. But I don’t see its benefit anywhere over Linux anywhere else. I would have picked the FreeNAS equivalent for Linux if I could — well no I prob wouldn’t, I’d wanna see what BSD can do. If your responses are related to something buried well behind the scenes of the system that are trivial to the end-user, you lose. If your responses are blaming the user of the system for not being responsible by running the hardware or software you choose and running the system as you wish, you lose. If your responses are about how BSD invented stuff that Linux stole, I’ll say you lose because you aren’t using the OS that invented the mouse. End-rant. Okay, I’m gonna install PC-BSD on my spare beat-up computer. 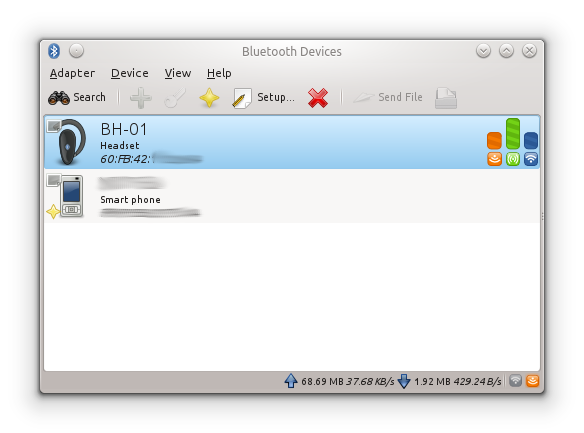 I had a bit of trouble getting my Linux (Kubuntu) to function as a bluetooth headset for my computer and I wanted to write this guide for anyone else having trouble. Second, get your device to pair. I used Blueman, an applet that came with Kubuntu. and then restarted pulseaudio as root. Per the folks on Freenode’s #Linux I could have also started a program that uses pulseaudio, but this worked. Afterwards, audio was playing on both my computer’s regular speakers and the headset. Only downside: When I play a game like Counter-strike, there is a very slight delay between the action and the audio. I have no idea what the cause of that is.